A team of medical workers don protective equipment before entering an Ebola Treatment Center in Beni, the epicenter of the outbreak in the Democratic Republic of the Congo. Mike Ryan of WHO says it's first important to note that, from the get-go, it was clear this outbreak was going to be extra challenging. It's taking place in a part of the DRC where a violent conflict is raging. "We've had relentless, persistent attacks going on," says Ryan, assistant director general for emergency preparedness and response at WHO. "Since the 24th of August, we've had 11 separate incidents." Among the worst: Two weekends ago rebels killed more than 20 people — mostly civilians — in an attack on a city called Beni that is the current epicenter of the Ebola outbreak. "That's extremely close — that's a thousand meters [a little more than half a mile] from where we have hundreds of people based." After that attack, it took world health officials and their partners in the government three days to fully resume operations. And when it comes to Ebola time is of the essence. The main strategy has been to isolate and treat anyone with symptoms, then quickly track down anyone who has had contact with them — and any contacts of those contacts — to give each of them an experimental vaccine. The consequences of missing just one person could be dire. "Then potentially there are hundreds of more people exposed," says Ryan. Another obstacle to the vaccination effort: While thousands of people have agreed to be vaccinated, practically every day, Ryan says, "we've had situations where vaccination teams have arrived in villages and there's been people claiming the vaccinators themselves are bringing the disease. And we've had vehicles stolen and people having to leave." 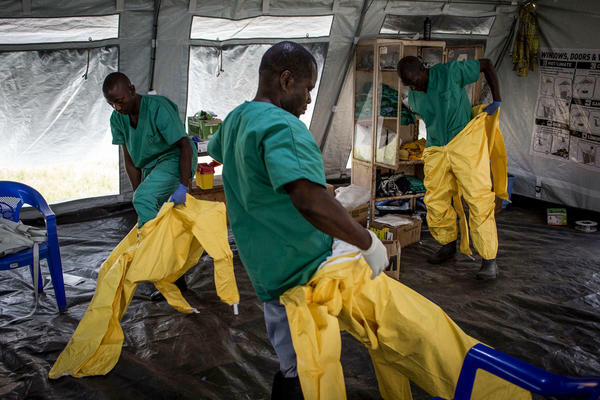 There has been a similar backlash when teams come to do safe burials of people who died of Ebola. Often, says Ryan, the families of the deceased want the teams to conduct the burial, but others in the neighborhood or village have prevented burials by stoning the team's vehicles — in some cases causing serious injuries. Ryan says the hostility is partly due to an understandable distrust of outsiders bred during years of violent civil strife in the region and the sense that the international community has done little to help. But there are also signs that "others [in certain communities] are now fomenting that kind of frustration driving it for personal or political ends," says Ryan. Whatever its causes, the mistrust has helped drive a third development: On multiple occasions, people infected by the virus in the epicenter have refused treatment and fled to locations several hours drive away, only to surface once their symptoms have gotten severe. That happened most recently in a city right by the border with Uganda. The spread of distance is stretching the capacity of responders. In fact, on Wednesday WHO's director general Tedros Adhanom Ghebreyesus called on international donors to increase their funding for the response. The continued appearance of cases in new locations could also be a problem because of another distinctive feature of the province of the DRC — called North Kivu – where the outbreak has been centered. "North Kivu is one of the more densely populated areas of the Congo," says John Johnson, who has been working there with Doctors Without Borders as a project coordinator. Johnson notes that one of those cities with new cases, Butembo, has about a million people. Johnson's biggest concern is the risk of spread in such a densely populated city. If one of those places starts to have a large number of cases, he says, "It's going to be very hard to keep up with." But WHO's Mike Ryan points out that so far the spread beyond Beni has been limited to isolated cases. "This isn't being spread from town to town along a wave," he says. "It's like sparks that have jumped across the rainforest and started a fire somewhere else. This suggests that if health teams act fast these new clusters can be extinguished quickly. One hopeful sign is that, for the moment at least, all of the new cases are linked to infected individuals that health officials already knew about. "We don't believe at this point that any of our chains are linked to some undetected chains," says Ryan. The upshot is that heath officials appear to have reached a sort of draw with the virus. The number of new cases has not been rising from week to week. But neither is it declining. Instead, says Ryan, "we're stuck around seven to 10 cases for the last number of weeks." What will it take to drive new cases down to zero? "There are some responses [to outbreaks like this] where really the end is prolonged and sometimes painful," says Ryan. "And this is one of those situations where we have got to be prepared to grind it out." More than two months since an Ebola outbreak was declared in an eastern part of the Democratic Republic of Congo, health officials are still struggling to end it. So far, at least 130 people have been infected. Last week, the World Health Organization declared that the risk is now very high that the disease will spread to other parts of the country and to neighboring countries. And yet there are some key health officials who remain optimistic that it won't actually come to that. NPR's Nurith Aizenman has more. NURITH AIZENMAN, BYLINE: It was always clear this outbreak was going to be extra-challenging. It's taking place in a part of the DRC where a violent conflict is raging. Mike Ryan is an assistant director general of the World Health Organization. MIKE RYAN: We've had relentless, persistent attacks going on since the 24 of August. We've had 11 separate incidents. AIZENMAN: Among the worst - two weekends ago, rebels killed more than 20 people, mostly civilians, in the current epicenter of the Ebola outbreak, a city called Beni. RYAN: That's extremely close. That's a thousand meters from where we have hundreds of people based. RYAN: Then, potentially, there are hundreds of more people exposed. RYAN: Vaccination teams have arrived in villages, and there's been people claiming that the vaccinators themselves are bringing the disease. AIZENMAN: The protesters have stoned vehicles of health workers and also safe burial teams, sometimes causing serious injuries. And the mistrust has helped drive a third worrisome development. Multiple people who were infected in the epicenter then opted to flee to locations several hours away. That's stretching the capacity of responders. It's also concerning because of another feature of this province of the DRC, called North Kivu. JOHN JOHNSON: Well, North Kivu is one of the more densely populated areas of the Congo. AIZENMAN: John Johnson has been working there with Doctors Without Borders. He notes that one of the cities with new cases, Butembo, has about a million people. JOHNSON: It's going to be very hard to keep up with. AIZENMAN: But the WHO's Mike Ryan says it's worth noting that so far, the vast majority of cases are tightly concentrated. RYAN: This isn't spread in the classic sense of moving, you know, from town to town along a wave-like transmission. It's more like sparks that have jumped across the rainforest and started a small fire somewhere else. AIZENMAN: And for the moment, at least, all of the new cases are linked to infected individuals that health officials already knew about. Ryan says the upshot is health officials have reached a sort of draw with the virus, with the number of new cases plateauing at seven to 10 per week. What will it take to turn the corner? RYAN: There are some responses where, really, the end is prolonged and sometimes painful. AIZENMAN: This is one of them, Ryan says, so we've got to be prepared to grind it out. Nurith Aizenman, NPR News.